Most problems can be resolved by completing steps 1 and 2 of this troubleshooting guide by ensuring the remote boots up properly and the latest firmware is running. Place the SUR-0500 into the charging base. Confirm charging base is working. With the SUR-500 remote on the charging base, press and hold Home + Power buttons for 10 seconds. The SUR-0500 screen will shutoff. (Goes to black). Release Home + Power, and the splash screen will display to start the animation, which takes approximately ~90 seconds to complete. If the SUR-0500 has been configured before, manually update the firmware, until no more firmware updates are available. 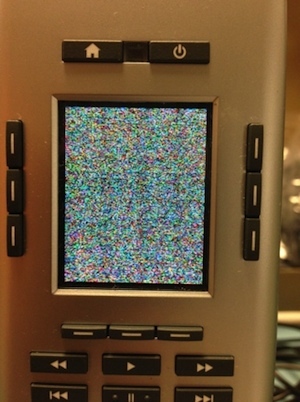 Note: If the remote has already been used and configured with a working Wi-Fi® at the current location, it will display Loading... while it tries to connect to the host. On the SUR-0500, go to Settings > Send Logs. This sends the logs to the Master Host. Please replicate the situation before sending the logs to the Master Host. Note: The logs for the SUR-0500 are reset after a reboot of the SUR-0500. The remote has an issue talking to the battery fuel gauge chip and displays whatever is in memory (random pixels). Place the SUR-0500 in a powered charging base. While in the charging base, press and hold the Home + Power buttons. Hold the Home + Power buttons until the screen goes black and then displays Savant. Leave in the charging base to fully charge. If the above steps do not work, submit an RMA Ticket with Required Ticket Information. Issue is related to the OLED. RMA the remote as this cannot be fixed in the field. Submit an RMA Ticket with Required Ticket Information. Remote falls asleep while updating firmware. Firmware did not override sleep time while updating firmware. Keep remote awake by shaking every 30 seconds during the download. The remote is reporting 0% charge but cannot get to 1%. 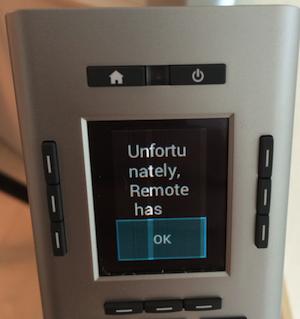 This is due to incorrect firmware on a chip that is used to monitor the power buttons to turn on the remote. Make sure the charging base is connected to the power supply. Place the SUR-0500 securely in the charging base. Let the remote charge for 5 minutes. Remove remote from the charging base. Press and hold the Home + Power buttons while re-docking the remote. Let the remote charge for 10 minutes. Undock the remote, if the remote displays Low battery the remote is now properly charging. Place the remote back on the charging base until fully charged. The remote application has crashed. Go to Settings > Send Logs. Get the logs for the master host using System Monitor or screen share with the master host and get the logs using Terminal and running the/rpmGetLogs command. Create an RMA Ticket for Engineering; please provide the Required Ticket Information. No networks appear in Settings > Wi-Fi. If the remote battery dies or the remote is powered off within 2 minutes after resetting the remote, it may corrupt the wpa_supplicant process. Verify that Wi-Fi networks are available when using another Wi-Fi device. Go to Settings > Wi-Fi and look for a network. 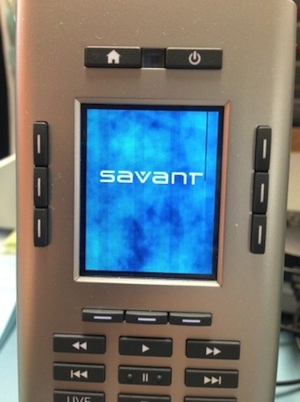 If no networks are found, hold the Home + Power buttons until the screen goes black and then displays Savant. Once the SUR-0500 fully loads, the Wi-Fi screen will show the available networks. The battery in the SUR-0500 depletes at a rapid rate and does not appear to retain a charge even when not in use. Ruckus WAPS and/or networking gear utilizing Ruckus Zone Director. Workaround: Settings can be changed on the Ruckus system to disable Directed-Multicastpackets. Savant has been provided the procedure below by Ruckus. Using Terminal, SSH into the Ruckus AP. Type quit and press the <ENTER> button to end the terminal session. Using terminal, SSH into the Ruckus Director and login.